Wizards Wheel 2 : The dimension is in peril and only YOU can save it in this brand new Idle RPG. Tap to guide your heroes through the frontier, find and upgrade new heroes, battle monsters and collect powerful upgrades. See if your heroes can survive Wizard’s Wheel 2, an epic idle, retro RPG! This is an RPG clicker game like you’ve never played. You’ll have to battle monsters, loot epic equipment, level up your skills and create a party of heroes to go deeper into dangerous dungeons. Spin your Wizard’s Wheel to accelerate time and find hidden treasure in a pixel dungeon, making sure your tap heroes survive difficult bosses! 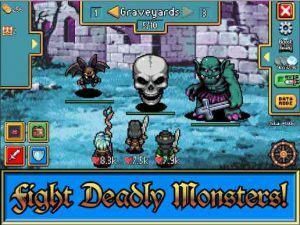 Idle and defeat giant bosses, traverse the dangerous wilderness, play offline and battle monsters of every kind in this incremental RPG! Use your Wizard Wheel tap powers to hunt epic loot! Dungeons cover the land and must be defeated by your idle heroes. Each pixel dungeon is packed with 100’s of monsters. Explore Dungeons offline in this retro clicker! Idle heroes are everywhere, you just have to find them. Collect over 50 heroes as you crawl through dungeons! Find hidden loot and customize your heroes with the epic loot. Play as much or as little as you like! Time Warp to reset, gain powerful upgrades and play again! Your heroes keep leveling up even when you are offline. Return to collect the loot and build up your town! Lovers of retro RPGs and incremental clickers won’t be able to put down this idle wizard RPG. Go on an epic tap adventure, use your Wizard’s Wheel to accelerate time and defeat the tough dungeon bosses in Wizard’s Wheel 2! Enjoy it online or offline! New alternate art frames added. Fix: Ore now drops correctly.